As I mentioned in the Ongoing Discussion I attended the FotR Live performance last Friday with 5 of my friends. It left us all in awe. I have now digested the performance for a few days and feel that I can put a couple of thoughts to words. And then we heard the ringing fanfares echoing in the lobby (the lobby chimes) that beckoned us into the concert hall and we quickly ushered ourselves in, not wanting to miss a thing. As we found our seats I had a good look at the orchestra and choruses congregating before us on the stage and I felt giddy with anticipation. Lights dimmed, the screen showing the LotR logo flickered. Our conductor Erik Eino Ochsner and the lovely and talented Kaitlyn Lusk arrived on the stage with a round of applause. My friends, at that moment I thought this would be a night to remember. With a subtle gesture from the conductor the magic began. And indeed it was just that for me. To recount themes and how they are used is a bit futile here as most people know the music intimately and inside out. I spotted a few of the alterations Doug and others have mentioned that Shore has made to the score, namely adding certain passages or augmenting moments with choir originally intended for them but left out of the film. They both bridged silences and also gave this performance a unique feel of an independent concert work. But I will add about the themes that I too saw the music more clearly, identifying the specific moments of thematic interaction or use that had faded from my memory since I had not seen this film in a couple of years. This gave again clarity and added respect for the details in this music in a completely new way. To hear the most intimate passages now in the forefront when they would usually be in the background of soundmix was something of a revelation in places, small operatic gestures Shore so often refers to came all the more apparent and more powerful. The careful back and forth movement in the dialogue scenes, the entrance of a theme on a specific moment all seemingly effortlessly captured by the music and the performance. And this performance as I said above was near perfect, the orchestra, instrumental soloists, Tampere Philharmonic Choir, Pirkanpojat Boy Choir and the boy sopranos Eetu Halme and Kalle Pääkkönen all contributing at the highest level. Kaitlyn Lusk's solos were especially magical and her talent so obvious, bringing me nearly to tears during Gandalf's Farewells in Moria and Gandalf's Lament in Lothlorien. The boy soloists were truly impressive and I was rooting for them through the whole piece. An inevitable problem with live performances became evident during the evening, namely the balancing of all the performing forces in the mix. Conductor Ochsner maintained an admirable balance of sound throughout but a few times the orchestral din threatened to drown the choral and soloist passages or the instrumental solos. But all in all everybody gave a powerful performance throughout, all textures and vivid colours coming together to form a grand tapestry of enchanting sound. To mention the most memorable moment in this concert is near impossible as they came thick and fast one after the other. 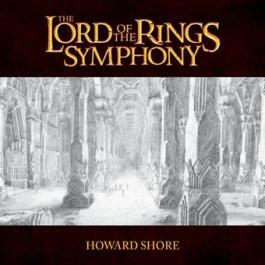 The above mentioned solos of Kaitlyn Lusk, the Amon Sûl scene with its pounding Ring Wraith music, aleatoric fanfares in Give Up the Halfling, the proud french horn solo of Gondor's theme, The fulgurous choral fury of Moria, all the appearances of the History of the Ring theme, the bucolic and nostalgic Shire themes, Watcher in the Water again with the deliciously aleatoric bubbling and mayhem, Isengard theme's numerous outings, The Nature's Reclamation soloist moment, Boromir's noble and tragic end. The list goes on and on. The amount of orchestrational details that came alive and audible in the live perfomance gave the familiar music a new cast and had an electrifying power to it. With the added bonus of the film playing in the background I was at the edge of my seat most of the performance. 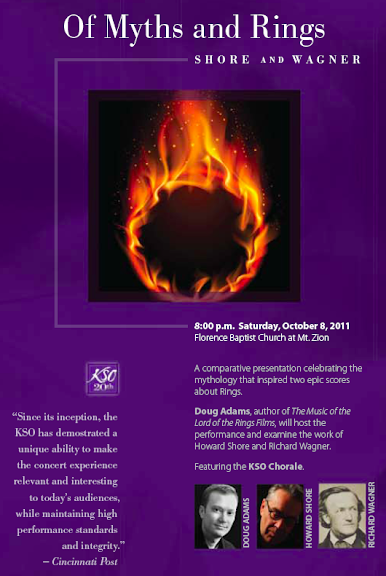 It was a supreme emotional (but curiously also intellectual) experience that testifies of the keen and lasting spell of the Ring and its music and the power it has over us time and time again. So three hours (plus an intermission full of giddy praise and awed discussion) later we were leaving the concert hall behind in an elated mood, stepping out to the warm spring night and all six of us made a promise that if The Two Towers Live projection came to town (hopefully next year) we would definitely be there. To repeat the oft coined phrase, certainly a night to remember.